How Safe is Your Data - How Secure is the Cloud? As we step into a future where more and more businesses are becoming Cloud dependent, migrating their data and infrastructure. The first question that comes to mind is ‘how secure is the Cloud’? Let’s start at the beginning. The Cloud is not vaporised water in the sky, nor is it a physical thing. The Cloud is a network of servers which run software and services. Many companies are using the Cloud, and you probably are too! When you send a message on Facebook or an email, you are using the Cloud. One of the benefits of the Cloud is that it allows you to work with data in real-time, from anywhere. This all sounds incredible but it also makes you very sceptical of how secure your data actually is! On 31 August 2014, there was a massive breach of Apple’s iCloud security, leaking over 500 photos of celebrities to the public. This event has certainly left everyone doubting the level of security the Cloud can provide. I mean you probably have an anti-virus, don’t you? If it’s not safe on your computer, how can it be safe on somebody else’s? Maybe it is one of those free ones you downloaded. Heck, you may even have paid for it. With all this in mind, why is the Cloud still going? The Cloud is an ever-expanding service which grows every day. Three years down the line from the big cyber attack on celebrities, Cloud security has increased. Massively. For the Cloud, the more attacks that happen the stronger the security gets. For example, a bodybuilder will tear his muscle by lifting heavy weights and in a few days the muscle repairs but even bigger and stronger! Many dominant organisations are putting their faith in the Cloud, some of these companies are Google, Amazon, Adobe, SalesForce, Sage, Dropbox and many more! That’s all very well, but is my data safe? In short. Yes and No. You’ve probably heard the famous quote in Benjamin Franklin’s letter “… but, in this world, nothing is certain except death and taxes”. Nobody will ever give you a guarantee. The small print will always contain a disclaimer. Guaranteed! Now that we’ve got that out the way, let’s delve into the details of Cloud security and the main concerns. Question: If the Cloud is secure how was Apple’s iCloud hacked? Answer: It wasn’t. The breach was a result of vulnerabilities in Apple’s actual password security system. The hackers were able to guess the users’ passwords and security questions, the Cloud itself was never actually breached. Okay guess is not entirely accurate – complex and ingenious programmes compute those guesses. Keep reading to find out how to beat those. Question: How do the propeller heads protect the Cloud? Answer: If data security was an army, think of data encryption as the front line. Complex algorithms hide Cloud-protected data behind encryption keys. But can it be hacked? Yes, but the only way to keep it safe would be to put it under your mattress with your money! That being said, your Cloud-stored data is generally safer than your locally stored data. Cloud services use vastly more complex security methods than most computer owners have access to, or can afford to develop. Question: What can I do to keep my data safe? Answer: Don’t use the same password for FaceBook, Twitter, your home security alarm, Windows password, your bank, your email and your company data storage! Add letters – preferably letters that don’t spell real words – numbers and symbols and don’t use your child, or even your dog’s, name. Nothing to do with your personal life. Any hacker worth their salt will know your address, your husband’s name, where you work, the type of car you drive and your favourite food. Question: Okay I get the security bit, how about making sure I don’t lose it? Loss of data is much, much bigger than hacked data. Multi storage is the best advice we can give you. Check with your Cloud storage company. Ask questions. Investigate. Do they have a history of data loss and security breaches? How many copies of your data do they store on how many different servers? If possible, you can store it yourself on Google Drive or Dropbox to ensure that if your data is lost, you can easily locate it through the other platforms. The best security solutions offer constant support for their customers’ assets. This means 24/7 monitoring and support, 7 days a week, 365 days a year ensuring your website is up and running all the time! Distributed Denial of Service (DDoS) is where multiple compromised systems are used all at once to send vast amounts of traffic to one destination. This, in turn, will overload the server leading to the server crashing. DDoS attacks are on the rise, putting more companies at risk. Robust security solutions will focus on measures to stop enormous amounts of traffic hitting the servers all at once. This security includes monitoring, absorbing and distributing DDoS attacks to minimise the risk of the attacks being successful. The best Cloud security solutions help manage and maintain enhanced infrastructures for compliance and protect personal and financial data for regulated industries. Data breaches are an ever-increasing worry to all. The Cloud security features include protocols to protect your information and transactions to stop any person with ill intentions trying to snoop on your data. Cloud security offers great flexibility! You can increase your Cloud solution at times of high traffic surges, then scale it down once the traffic has calmed, so you to reduce costs. As you can see, the Cloud debate is an edgy, ongoing topic. While the Cloud has ginormous potential waiting to be realised, for some it may seem like a risky step into the unknown – but it always is when you try something new. I hope this blog has made you rethink the security of your data from a whole new angle. Together we can make the change to unlock revolutionary technology for new ways to run your business! 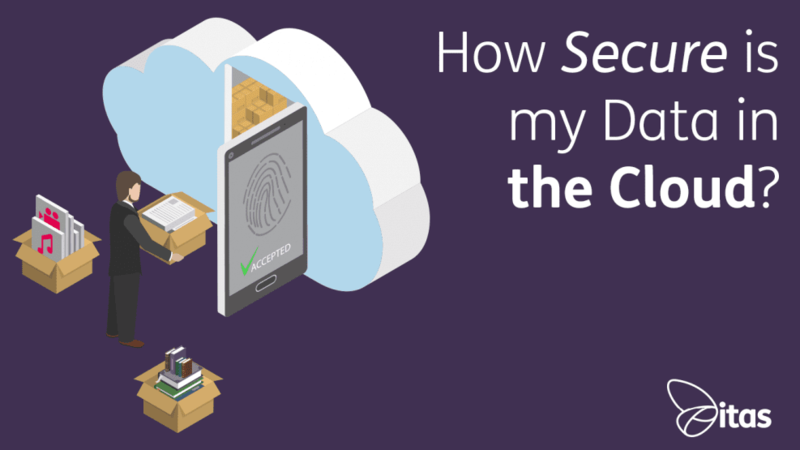 Home » Sage Blog » All Sage Blog Posts » How Secure is my Data in the Cloud?